Some people believe that weightless rigs only work occassionally or for small bass. A weightless rig has an endless amount of applications for bass and other species. I have caught just about every species you can imagine using weightless applications. Using this rig may seem very simple and easy to use, but for tournament fishermen it can be very difficult because of how slow you must fish using this technique. In the following I will discuss how to use weightless applications on different bodies of water, times to use the technique, and some lures to get you started. The big question is when should you try to fish weightless fishing rigs? There is no define answer to that question, however, here are a couple of factors to think about. First, what stage of the spawn or time of year is it. Weightless fishing can be very effective during the spawn while the fish are on beds, or in the post spawn because most fish are suspended and very inactive. Fish during the post spawn typically are looking for an easy meal, and one that floats right infront of them is about the easiest targets for them. Late spring through the summer months seem to be the best times for these lures. That is not to say that they wont work in the fall and winter months though. Second you should consider the fishing pressure that your body of water recieves. One of the easiest ways to catch fish on lakes or rivers that have an extreme amount of fishing or boating pressure is to go weightless. Another factor to consider is the water clearity of your body of water. You can fish a weighless lure in 20′ of water if the water is clear. If you are fishing muddy water then I typically don’t use this technique. Water current should also be considered because if there in a current then it will give the lure a more lifelike action. Time of day truly makes no difference other than lure choice. In the morning and evening you will typically get more baitfish lures to work, but in the middle of the day stick worms work very well. What bodies of water should we use weightless techniques? My answer to that is lakes, rivers, streams, and ponds. I know that doesn’t narrow it down, but there are certain factors to consider. The most important factor is the water clearity of the body of water. For example, this spring/early summer I was fishing at Lake Chautauqua in New York and the water clearity was around 8 feet. 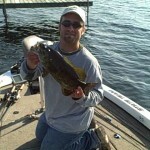 Because of that a stick worm and small minnow immation lure I was able to catch a bunch of 3 and 4 pound smallmouth. I tried to use the same lures at pymatuning lake, but I was unsuccessful mainly because the water clearity was around 1 foot or less. The two main places to fish a weightless rig in lakes boat docks and weeds. This doesn’t mean that you should skip throwing at stumps, bushes, and laydowns as well. In rivers and streams you should fish weightless in certain areas. My best area to go weightless is in shallow fast moving water. The bait will never be more natural than in the current floating down stream. Leave the lure on slack line and watch the line to see if it jumps or stops moving. The next place you should try is a boat docks. Once the sun comes up, these floating pieces of structure can be unbelievable. Two other places to try this style is on the rivers are metals break or retaining walls were fish suspend and by floating barges that are tied to shore. The more industrial pools of the river will have more of this type of structure to fish. Ponds are a place where you can always use a weighless rig and catch fish. Ponds rarely have water that is stained badly, so a stick worm is a safe bet. I hear a lot of guys always asking each other way lures to fish weightless. They are actually asking the wrong question. The true question should be what soft plastic lure can’t be used weightless. My answer to that question is that there isn’t a lure that I won’t throw weightless under the right conditions. Probably my favorite lure would be stick worms in varies sizes and colors. On the Allegheny, Ohio, and Mon. Rivers in Western PA I tend to use 3-4″ green pumpkin or pumpkinseed lures. Not all brands are created equally because the colors are slightly different or their fall rates are different. On lakes I tend to go with 5″ stick baits. Color selection is a lot of trial and error. For pond fishing I try to match the size of the bluegill that are in the pond. Some other lures to consider are fluke or minnow immitators, tubes for top water, floating worms for top water, and frog for top water. There are always more lures that will be successful if you just take the time to fish slow. One item that most guys over look is the type of line which they are using. If you want the worm to fall faster go with a 6-10 lb. flourocarbon line. Monofilament and braided lines float so they will be better with top water presentations. The secret to fishing weightless is being patient and working the lures very slowly. If you are looking for surface strikes you can speed up some, but the best action is typically on the fall. Crappie and Walleye fishermen tend to make good weightless presentations because they are used to fishing slowly. For myself it took a lot of practice and wasted time on the water to realize that fishing this way can be really beneficial to a bass fishermen. Remember to experiment as you fish this style. Some color, size, structure, or species is always willing to eat a slow presentation. Good luck.